There was no podium set aside for Elizabeth Warren, as there was for Vice President Joe Biden, in case he decided to thrill CNN and jump into Tuesday night’s Democratic presidential debate. But in spirit, the senator from Massachusetts was already on the Las Vegas stage. She, more than any other Democrat, led the way in shaping her party’s 2016 policy debate. 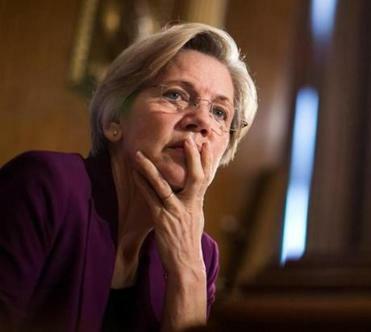 A draft Warren movement failed to draw her in. On the presidential campaign trail, Vermont’s Senator Bernie Sanders, a self-described “Democratic socialist,” is taking the fight directly to Clinton on trade, energy, and income inequality. But Warren first set the battle lines — and they are pushing Clinton to the left. As secretary of state, Clinton helped draft the Trans-Pacific Partnership, a free trade pact that Warren vociferously opposed. Now Clinton, too, opposes the TPP, insisting that a pact she once called “the gold standard” is no longer worthy of her support. While Warren has repeatedly vowed that she won’t run for president herself, she ought to reconsider. It’s also no accident that Clinton is standing behind the Consumer Financial Protection Bureau that Republicans want to dismantle. The watchdog agency was Warren’s baby, set up after the collapse of Wall Street financial institutions. When it comes to Wall Street regulation, Clinton doesn’t support reinstating the Glass-Steagall Act, which separated commercial banks from riskier investment bank business and was repealed during the administration of President Bill Clinton. But Clinton’s anti-Wall Street rhetoric is taking on a sharper tone — a clear reaction to Warren’s harsh Wall Street critiques, which are also echoed by Sanders. “We have work to do,” Clinton conceded during Tuesday night’s debate. That Clinton was able to talk issues and not e-mail was a victory for the beleaguered candidate. By surviving to fight another day, she won the debate night in Las Vegas. And for that, Clinton can thank Sanders. When the matter of how she stored her e-mail during her tenure as secretary of state came up, Sanders gave her a pass: “The American people are sick and tired of hearing about your damn e-mail. . . . Let’s talk about the real issues,” he said. As for how those “real issues” are defined — for that, Clinton can thank Warren.